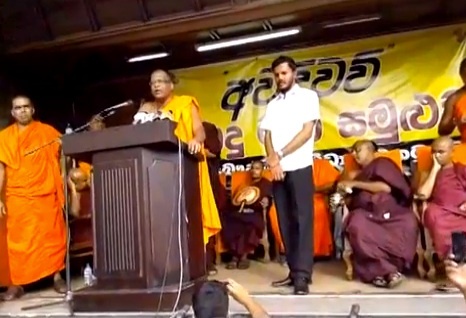 Galagoda Atthe Gnanasara in an inciteful and fear mongering speech in Aluthgama on June 15, 2014,prior to the riots said that “if one marakkalaya ( Muslim) lays a hand on a Sinhalese that will be the end of all of them” to a rousing and cheering crowd. According to the monk, the minorities are organizing themselves and he urged the Sinhalese to wake up and fight back before they get destroyed. He threatened to destroy Muslim businesses at Aluthgama, Beruwala and other places. He instructed his listeners to grab any bags with Halal signs and throw them on the ground. He asked his audience to fight against the minorities. Part of the audience shouted back saying yes, they will do it. The monk called the President of Sri Lanka Mahinda Rajapaksa a brainless person and asked whether any person with brains would appoint a Muslim to be a Minister of Justice. He told the crowd that party politics have destroyed Sinhalese and urged the crowd to unite and take things into their own hands. A large fund should be created by Sri Lankans who believe in Democracy and Rule Of Law to offer for information to anyone who can provide the identity of the “Thugs” who are in robes and in white shirt standing on the platform to prove to the whole world how the Regime of Sri Lanka is protecting this Gonsara Thero. Mr. Shan Wicramasingha (Ranil’s brother) is partially responsible for the birth of this neo sinhala Buddihist extremism phenomenon ,initially he was the one who promoted “soma” thero to whip the religious disharmony among the communities, he carefully used his TNL channel to sow the hatred seeds at the srilankan Buddhist community back in late nineties .soon after the demise of ven soma thero , some opportunistic monks and laymen used the soma thero’s popularity as a spring board to jump start where ven soma thero left off , which was the anti Muslim/Christianity rhetoric campaign , owing to TNL short sited vision , it gave the birth to “ Sihala Urumaya” baby , at the beginning Sihala Urumaya was very popular (especially among the senior citizens ) and every body made to believe that Sihala Urumaya was different from the rest of the other political parties and it was a truly genuine party which will stay away from petty politics , their true colours were demonstrated when they tried to share their first political appointment , ever since that racist party has been managed to spread their wings by amalgamating with other equally opportunistic/racist parties, thereby widening the gap among the communities .from the beginning this opportunistic racist elements used a phony patriotic/religious name as “ Sihala Urumya “ to promote Buddhism in SL ,TNL was there to provide unhindered media access to it’s campaign and in return Sihala urumya promised to reinstate a “dammadeepya “ , racist elements like Gammanpila /Champika never missed the opportunity to jump on the band wagon to reach their ultimate goal , which was becoming politicians , rest is history . TNL hasn’t learned a lesson yet , for instance Mr Madumadawa’s popularity has been artificially lifted by allowing him to conduct a prime time reality show on Saturday night(Dialog Ridma rathriya) , who is Madumadawa ? isn’t he a racist ? BBS is only another by product of soma thero/sihala Urumaya ! after all Mr shan wicramsingha is not much different to his ra Daniel dawal Migel brother Ranil. Sunil, it is more acceptable (to live with) and OK for TNL to orgqanize debates and introduce Soma Hamuduruwo to our Muslim brothers for us to understand their worries and objection, and try to be more sensitive to their concerns. But these rowdy actions go way beyond that and becomes a totally different thing when they take the law into their hands and act with impunity. But we Muslims do believe justice will be served and being patient and with prayer we will succeed. They cannot take away that hope and our spirit. you don’t seem to understand how it all started , it’s quite ok to exchange views in a civilized manner , but TNL went much more than that , Mr shan was instrumental in promoting Buddhism using Ven Soma thero whose motive was to demonize other faiths in a very subtle manner , in other words Soma thero was dead against at Buddhists followers who go to kovils simultaneously , in fact Soma thero was pioneering to separate the very concept of “Devala” from the temple , I’m not sure how far he had succeeded in achieving that goal ,in contemporary history , Soma thero was the first to inspire “True Sinhala Buddhists” concept and encourage not to believe in any other Gods but the lord Buddha , I know what I’m trying to say is not politically correct , my argument is not about believing in GOD or lord Buddha but to ascertain how this ultra racist elements started to raise its ugly head from nowhere , what was the reason to form that racist party “sihala Urumaya “ ? its name says every thing else , isn’t it ? , who represents “Hela Urumaya “ ? none other than ultra racist Champika and Gammanpila duo , what have they done other than supporting this corrupt, lawless junta regime ? ofcourse interested parties saw the potential of forming of their own ultra racist terror outfit like BBS to reach their short sighted goals is the end result. It appears to be the Tamils Diaspora’s responsibility to liberate the pity looking Buddhist Monks on the stage form the BBS. This is nothing other than “cheap drama” to divert the attention of the masses from the perill of the UN Human Rights Investigations against the regime (not against the people of Sri Lanka). This is manipulated by the Rajapakse regime. If not only based on this speech the regime could have arrested him and charged him under the Prevention of Terrorism Act. Is this act only against for the Tamils? That is the interpretation of his view, but that is not the truth. The Truth is racism, Sinhala, i.e. Para-Sinhalese racism using Buddhism. So, somebody tell these BBS, the truth, that they are Para-Sinhalese, with DNA in their bodies showing that they are from South India. If they cannot live in an egalitarian manner in keeping with they Native Veddah ethics, they are requested to get back to South India. Given Below is Amarasiri’s poster . What are the Facts? Test BBS and the Sinhalese racists DNA. It will show that they have the same DNA as those from South India and East India. 1.Science has come up with with CLARIFICATIONS and SOLUTIONS for THESE MYTHS and DREAMS. 2. Scientists say, based on DNA analysis of South Indians, East Indians, Sinhala, Tamils and Muslims came from Southern India. So, the Nagas or Nagas may be the same people, and were called Naga because they worshiped the Naga, the Cobra or “Snakes”. 3. The “Naga People” worshiped Naga and “Buddhist People”, Worshiped ” Buddha, the Shiva People Worshiped Shiva etc.? 5. The analysis of the DNA of Paras in the Land of native Veddah and the DNA of Veddah will confirm that. Further confirmation that the Sinhala, Tamils, Muslims are foreigners, paras from India and elsewhere. Science sorts Myths. Only the Native Veddah are the True sons and owners of the Land of native Veddah. Others are illegal boatmen, Hora-oru and Kalla-Thonis. If you want the facts sorted out from Myths, use science, that is more definitive than the other methods. The data supports that the so-called Nagas, are the parental populations of Sri Lankan Tamils, Sinhala, Muslims, and Indian Tamils. They for one cluster. “In conclusion, the original inhabitants of Sri Lanka were the Veddahs, who have had little admixture with the Sinhalese and possibly none with the Tamils. Here come the explanation why Hakeem said at Aluthgama that he cannot resign his minister post. First I thought that the BBS was trying to save the King. But the truth is no just that’s all. BBS has tried to save the Kings Ministers too. Isn’t this is an evident of King, his Minister and the BBS are in the same line? He is part and parcel of this deal. This man GAG is really a curse for our sinahala nation. If a regime respected LAW and Order, this man would not have any rights to incite hatred between folks. If I were a muslim, I would have done everything against this kind of hate mongers. Not once, not twice, several dozenes of times, this man WEARING sanga costumes -has been doing a criminal act. In April this man – even attacked fellow monks with Police looking at it. Where have the law of this country gone ? When did Mahanayakas object to their Sinhala/Buddhist flock harming the minorities? How many houses did you set fire to? Go join Banda’s “Rent a Mob” agency you will get more jobs in the next few days. No it was a serious question. Why cant they hang GAG by his alls. Time has come to say enough is enough. The bugger is born with all aggression potential… his words prove that not once thousand times. But him to continue this way – being on public stages should be banned if the country is governed by a leader that has a backbone. If MR touches anything, all that except anhilation of tamil srilankens, ended up in this way. He is the most abusive stupid, dangerous srilanken leader that the country ever produced. Sinahalyani.. Tamil and muslim brothers.. wake up to go against his brutal leader… Enough is enough. Whos is the man standing next to Ghanasara ? I guess he should be one of Abithayas – who eat the left overs of the temple of GAG – this is not buddhism I learnt in Daham Pasala decades ago. Mahanayaka or other theros should teach these terror monks the real teachings of Buddha. Why cant anyone pull the trigger against this man GAG ? I am very hurt when I llisten to this kind of video. Parah, Ballah, ai yaoko. Marakkala .. etc..
Where is the Law, Law, Law ? The law has gone to the dogs as dogs have begun ruling the country. If you could please reveal us -the CT readership – the background of Ghanasara ? From what I heard he should be a person who has gone through a various torments in his childhood to behave this abusive to this day. I raise the question not once several dozens of time, why other senior monks stay scared still when the highly abusive monk make public hate speeches. Agree with above comments, that there is no law in the country today. This alone should be considered by all right thinking ones to send MR go home. I’m yet to find Mr Gnasar’s true history , there were so many stories going round but none of them seems to be trust worthy sources ,so I will refrain from publishing it here. all I know is Mr Gnasara (GAG) was a former member of JHU and contested 2004 general election in Colombo district. The BBS was founded by monks Kirama Wimalajothi(KW) and Galagoda Aththe Gnanasaara after they broke away from Jathika Hela Urumay (JHU) claiming it was not militant enough in protecting Buddhism. Now KW seems to be distancing himself from GAG and his activities , GAG running in to trouble as bank accounts and other properties are under KW , these are all new developing stories , will wait and see how this drama going to end up ! You also forgot about the article on CT along with the copies of court documents where gandassara was charged and plead GUILTY on 12 counts of driving under the influence of liquor and killing a Muslim and a Tamil at a pedestrian crossing and immediately fleeing the scene, BUT was caught and produced before courts. I hope someone can bring the link to that story… maybe Amarasiri, Native Veddah, Ben Hurling or even the CT admin might be able to copy the link to that article. honestly i haven’t forgotten that episode , i vividly remember that unpleasant photograph of GAG , how can any one forgets that ugly scene ? remember how he was putting half of his body out from a moving CTB bus and screaming & yelling at someone outside ,if my memory serves me right , he didn’t kill the pedestrians , rather he broke the poor pedestrian’s legs by driving under the influence of alcohol, there was another ugly incident which took place , where GAG tried to disobey the traffic police at the entrance of free way and ended up in a heated argument . actually i am not in to these type of recent incidents ! rather , i want to find about his childhood and his family back ground , has he had an abusive child hood ? has he been provided a secure family environment , etc ? we all know his resent history ,so need to repeat the same old story here , as you said it was right here in CT , if any one can come up with genuine details ,and share with us it would be a great help. destructive morons hiding behind Sinhala ID. yes it is true that section of our srilankan society is pathetic , never mind what GAG utters there , we can’t expect any thing good from that evil creature , tell you the truth i’m some what surprised of his chosen vocabulary , this creature often loses control and tend to react to cheering crowd , i was expecting much more filth than this , remember how iron Mike Tyson behaved in and out of the boxing ring ? he often reminds me iron mike Tyson . Law is in Law College.What a fuss you are making Seven Perera. After holding the hate speech to end up it with BUdusarnai is the most joke. I really dont know that the audience were educated to listen to this kind of speeches. .. THEY looked as if North korean folks were forced to mourn in a state funeral ceremony. Asked, why if would nto do so, the punishments are waiting for them. Now srilanka has become not second to a state similar to North korea.. by all means. think MARA is also getting orders from somewhere? will be used to fly to middle east for assistance! Jamiythul Ulema and some other religious groups. religious leaders who sell the name of Allah first. Why has Gnanasara not been arrests in this highly militarized country? And why has Gotabaya Rajapaksa the patron of Balu BBS Sena and the person responsible for so many killings, not been arrested? Where is that clown, the dead Leftist Vasuedeva Nanayakkara – so called Minister of National Languages and Social Integration whose ministry is run by his son as a family business? What about the Bill on the Prevention of Incitement to Religious and Racial hatred that this ministry was to present in Parliament? Vasudeva Nanayakkara must be forced to resign from Jarapassa’s Cabinet of clowns, so to Hakeem – so called Minister of Injustice, Shame and Cowardice. You can wait until his death, Vasu is not the vasu we lernt 80ties. He and Viktor Ivan and the like critical voices have swallowed pills given to them by Jarapakshe —> This is the reason them to be Kirimati gilalawage – as if they become clay fed crocodiles. Only person that would do something against the current problems is Anura Kumara D as I feel. He brings all the facts and figures as they could easily go to the masses – masses whose brains have been twisted by Ghanasara sara and other illfated buddhist monks. I am not a muslim, but I believe they should be fed up of the situation right now. They are being attacked on and on. On the interview made with that brainwashed Dilantha Liyanage ( whose background should be more radical than any average ones in the country) denies any kind of hate speeches to have delivered. We have all evidence at our hand, but they go on saying like this for the last 3 years. Man in power stays as if he is not the president. He goes on honey moon to the countries where he feels he is welcome. Next time will be to african Swaziland or far isolated Belarus in eastern Europe. So called arranged felicitations for his so called achievememtns are being set to air – to get his attention. Some latin american country are as so poor as some afrostates. Meaning not that we must not stay in contact with them, but closing all ties with any kind rich nations but to go after mentioned states – seem to be man’s policy acceptance. We are sad to reveal nevertheless, so far none of the perpetrators of these crimes have been arrested. As of now Gnanasara and his drunken goons are roaming free inciting hatred and unleasing violence. Although the law compels their arrest, ironically it is seven Muslim victims who are now in police custody. Out of the nine Muslims killed, two were shot to death by BBS goons in Dharga Town on the 15th. There is no investigation how these murderers obtained fire arms. There has been no magisterial enquiry. It is well known that Medamulana MaRa started the terrorist organizations BBS and Sihala Ravaya. He nurtured and fattened them with the Government’s Secret Security Fund. The Buddhist terrorists (oxymoron? Ha, ha!!) are now wreaking havoc. Prior to his departure for Bolivia, the Mara instructed his criminal to use Gnanasara to create pandemonium among the Muslim community. And while his brother was faithfully carrying out “orders” he babahukumly tweeted from Bolivia “everyone please, exercise restraint”. Upon returning to the country, the first thing that this “concerned” President did was tour the devasted Aluthgama and Beruwala to inspect and admire the handiwork of his loyal brother. They hugged and embraced each other just like in that salivating photo readers have seen so many times on these pages and puked. Gota says to Mara “Aiye, hereafter no Sinhala Buddhist will ever vote for anyone but for you”. Mara says “Sadhu, sadhu, father will be very proud”. I am all for pointing out the rights of the Sinhala Buddhists but I cannot stand up or agree with or approve such loathing and inciting speech. All that good work done by the BBS have been washed down the drain with this racist remarks. Gnanasara is no different to Bin Laden or his prophet. I sympathize with the predicaments Ven. Wimalajothi is facing. Alzheimer patients like you to get it took that long. But we have been against this radical bunch from day one. I as one have been living out of the country for the last 3 decades – was not that saddened hearing the news of SUDDEN death of Soma thero. He was the person to have started first ever kind of hate speeches in the country. And the culure introduced by MR and his clans worsened the situation – I hear mostly the way MR speaks using all kind of sinhala filthy on the stages. He also allowed Mervin the vermin of the nation to continue that. And the fact that Transport minister also not far from the levels of Mervin. All these for the last few years added to the normal langague of sinhala people. The words like neger ( to black people) are banned in some countries in Europe. These racial derogotary terms only create angers among the met communities. In Germany, if you attack anyone in public, you have to count with due punishments. Laws of that kind prevent many being attacked by hateful ones in the society. Why the authorities to stay mum not doing the due in this regard is the question that comes to anyone with sanity today. Regardless of party politics, people have to find a common platform to find soltuions to this kind of racial issues – if govt would not allow, people have no other alternatives than go on protests… not day long but weeks long… peace is what we have been struggling to gain, if that is not the case under the governance of the ruling bunch, people have to send them home. The Koran is the masterpiece of hatred. It contains at least 109 verses that call Muslims to war with non-believers for the sake of Islamic rule. It commands Muslims to chop off heads and fingers and kill infidels wherever they may be hiding. And Muslims who do not join in that fight are called ‘hypocrites’. And you lot worshipping it. Koran says killing a one person equal to killing a whole human nations. Unless you found yourself the truth, don’t borrow the ideas from unreliable source. of BBS in Aluthgam-Beruwala and beyond? On 15 th at noon , Pradeep Kumara had phoned the IGP and reported , the violent situation that prevailed a few days ago had not died down , and the feelings of the people of the area are still running irrationally high. Based on reports received by him at ground level , if the meeting is allowed to be held , the already volatile situation can turn explosive. The OIC had therefore sought the IGP’s instructions to ban the proposed meeting. The IGP who could not discard the assistance sought by his subordinate and himself harboring fears as he himself was fully aware of the dangers had explained to criminal defense secretary Gotabaya over the phone in detail of the grave risks besetting the peace of the area and the violence that can erupt if this BBS meeting is held. The IGP had therefore asked Gotabaya to grant permission to ban the BBS meeting. Gotabaya the defense secretary alias criminal offense secretary, on the other hand had replied in the negative. Instead of giving consideration and showing concern to the dangerous violence in store for the innocent people , the criminal defense secretary had instructed the IGP not to obstruct the meeting of the BBS under any circumstance , and to give protection to the world recognized terrorist organization, and Gnanassara its demonic leader. Accordingly the IGP had given a directive to his subordinate not to ban the public meeting of BBS terrorists. Consequently Gnanassara was provided with a security detail of six STF soldiers and a defender vehicle thereby precipitating a communal holocaust – the inevitable result SL’s criminal defense and communal offense secretary Gotabaya longed and prayed for ! CHEAP POLITICAL… END OF THE DAY WE (THE SINHALA, TAMIL, MUSLIM CIVILIANS) PAY THE PRICE.. MOTHER LANKA USED TO BE A PARADISE???? The captivating speech by the most Venerable Galgoda Atthe Gnanasara is a defining milestone in the evolution of our motherland. This speech is on the lines of Martin Luther King’s “I have a Dream” delivered to the US. This is a defining moment in the history of our nation. The fundamental precepts ennunciated by Ven GAG will define the destiny of our wonderful nation in the decades to come. We are indeed, on the path to being the Wonder of Asia, the Miracle that surpasses everything. a speech that should be used by gon raja aka mohomed rajapakshe, if he needs to win the 3rd term. This is a good sign – how come this ridgewalk (tighttrope walk)? ela kolla has always seen it clearly. gon raja aka mohomed rajapakshe should crush muslim invasion and speak to the hearts of sinhalese buddhists. if not gon raja aka mohomed rajapakshe should be ready to go home. You the ones who constantly have been in the licking mode – now come to tell us about the other way around. MR should not be a leader for a nation whose literacy rate is reported to be comparable to that of a developed nation. MR has no vision, no wisdom, he has proved… only killing friendly tactics – all or not decisions together with the fearless and brave efforts of srialnken forces saved the nation, ….. this man is just a MODA actor he would not be able to deceive the same folk again and again. this is not a Buddhists monk. this is a thug .work for some organization to destroy real pure Buddhism. Don’t you feel that we all miss President Premadasa at a time like this? GTG would have been silent and long gone to where he belongs. Sometimes, a regime like that helps to shut people up like this. I wonder what President Rajapakse’s feelings were when he was called ‘brainless’. This monk has the audacity and the guts to call the President of Sri Lanka like. Someone should really go through his childhood whereabouts, from where he came etc. Sometimes when there is insecurity in life, these could crop up….anyways, he is cursed….and judged….he will be punished not by people but by the person living above all of us. This will happen in front of all whom he terrorized and abused. This is all but political drama – it is a ploy created by the Rajapaksa – trying to make it look as authentic as possible. The point is to create a Sinhala-Muslim antagonism, and use it in winning forthcoming elections and in facing major international challenges. It’s quite plausible to say that Ven. Gnanasara was encouraged (by an invisible hand with a moustache and spectacles, perhaps…) to be critical of the government and the pro-devolution folks in the cabinet. At each point in post-independence Sri Lankan history, be it 1948/9 (suffrage for the plantation workers), 1956/7, 8 (Sinhala only and ensuing discontent), 1983 (Black July), 2014 (Aluthgama), communal tensions were sharpened and violence was encouraged solely by politicians, for political advantage (all other points are secondary, some amounting to hogwash). All news stations must copy this and forward this to the UNHCR and other relevent authorities. IF OBL(Osama Bin Laden) was considered a terrorist so is Gandassara. He accepts he is a ” Agamvadi” and many other vadi’s to the applause of the DUMB extremist buddhist’s present here at this meeting..this also need to be translated into English for the world to see… He should also have a travel ban on him.. Although the behaviour of BBS can not be accepted at all, the issues and the content Gnanasara is addressing have some truth. I have witnessed this in Kandy courts too. if that is the case , what would you say to Prabakaran’s actions ? after all he had some genuine grievances, aspirations , hadn’t he ? i’ve already posted the above AJ interview some where else here , for the benefit of other interested parties , here i’m reproducing it here. Who is behind Sri Lanka’s religious violence? You don’t need to be a racist to talk fact. The points GAG raises are very true. I don’t accept the language he uses. It is high time to raise the voice of the Sinhalese people to protest against these fundamentalist muslims who are obviously racists. If we as Sinhala Buddhists protect this land there will not be anyone. It is time for us to decide whether to give away or to hold on to the culture, religion & the county.